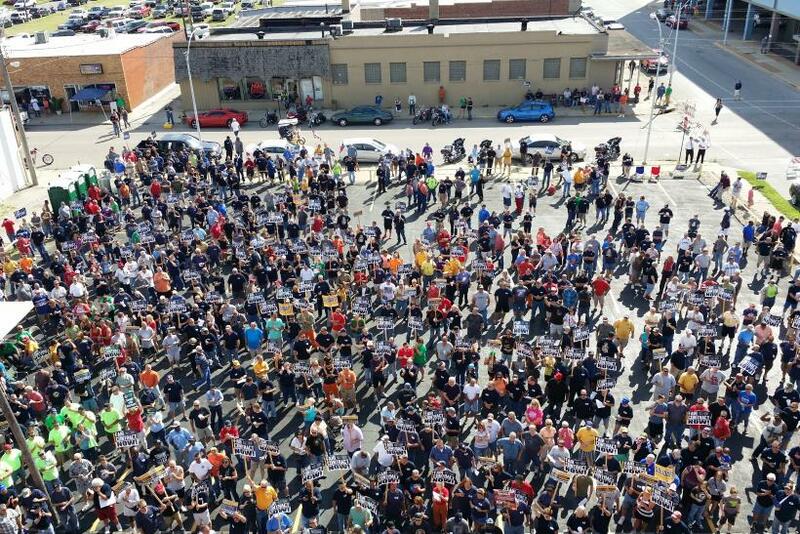 GRANITE CITY, Illinois— Hundreds of steelworkers and their families are gathered in the parking lot of the union hall, placards and posters raised. “Fair Contract Now,” most of them read. “Steelworkers Lives Matter,” says one. “Stop Hurting The Working Men, Start At The Top” says another. Down the street looms the local corporate headquarters of U.S. Steel, a few of the windows propped open — perhaps to get a better glimpse of the rally, or to just catch a breeze on this scorching August afternoon. Off in the distance, a blast furnace grumbles, firing down beams of piping hot air at a churning blend of coke, iron ore and limestone. “Is this a steel town or what?” says Dan Sykes, president of United Steelworkers Local 68, to thundering applause. Granite City has been one for over a century — and a union town, at that. Even before the&nbsp;wave of Depression-era organizing&nbsp;won&nbsp;a&nbsp;historic nationwide contract, political and social life in this small Southern Illinois town was dominated by the skilled steelworkers and their union allies. They elected socialist and labor-friendly governments in the early decades of the 20th century, leading the local paper to proclaim Granite City to be a town where “the laboring man is king.” Now its future may hang in the balance. Earlier this year, U.S. Steel nearly idled the mill because of tough industry conditions. The biggest challenge: a steady stream of low-cost steel imports from China and other Asian countries that has driven global steel prices downward. The influx threatens to expand further&nbsp;as Chinese central bankers move to devalue the yuan in a bid to jump-start their sputtering export-driven economy. Meanwhile, declining oil prices have made things worse, reducing the American energy industry’s reliance on steel pipe. And there’s more: In less than a week, a labor agreement that covers nearly 20,000 employees at U.S. Steel — including the roughly 2,000 workers at the Granite City Works, by far the city’s largest employer — will expire. And as the company demands a host of concessions amid the downturn, workers are bracing for the worst. The Steelworkers are telling members to prepare for the possibility of a strike or lockout -- something that hasn’t happened at U.S. Steel since 1986. The decline of steel is a decades-long story that still haunts hundreds of communities across the country, from Bethlehem, Pennsylvania,&nbsp;to Hennepin, Illinois.&nbsp;The&nbsp;pain that&nbsp;laid-off workers feel&nbsp;is just as raw as it was back then, but&nbsp;the challenges employers&nbsp;face today are new. When industry woes piled up in the 1970s and '80s, workers frequently blamed companies&nbsp;for failing to invest in new technologies and kowtowing to the interests of shareholders over labor. (That charge wasn’t out of line: Amid&nbsp;a brutal string of plant closures, U.S. Steel famously bought Marathon Oil Company in 1982 -- an investment&nbsp;that was seen as more&nbsp;lucrative than&nbsp;deciding to improve&nbsp;old steel mills.) Today, though, integrated steel plants in the United States tend to be highly efficient operations with state-of-the-art technologies. It’s the only way they can compete with foreign producers. And to some extent today, labor and management feel like their interests overlap.&nbsp;The Steelworkers&nbsp;and major&nbsp;domestic employers have teamed up on more than 30 successful trade cases&nbsp;with the U.S. government&nbsp;since 2001, challenging other countries, including China,&nbsp;of “dumping” their cheap steel in the U.S. at unfair prices and illegally subsidizing exports. But it's a&nbsp;limited tool.&nbsp;Complaints are costly, they’re time-consuming and not every batch of imported steel breaks the law. China's surge in production has&nbsp;transformed global steel&nbsp;markets.&nbsp;Now, as China&nbsp;faces sagging demand within its own borders, it is ramping up exports.&nbsp;And the most recent wave of its steel to hit an oversupplied international&nbsp;market&nbsp;has&nbsp;driven down global prices. That pressure, in turn, helped push&nbsp;U.S. Steel to issue 9,000 layoff notices in North America this year, according to the Pittsburgh Tribune-Review’s count. The Granite City rank-and-file aren’t just frustrated with going up against Chinese producers. “You can’t compete with a country that has no OSHA, no EPA, low wages,” says Pat Doyle, 48, a third-generation millworker over lunch at Aiello’s Pizzeria, a downtown pizza parlor run by a former steelworker. Doyle also blames the federal government for not doing enough to protect American manufacturing. Specifically, he means its unwillingness to hike tariffs on imported steel or more aggressively crack down on trade violations. He adds that he sympathizes a bit with Donald Trump’s campaign and was impressed when the Republican front-runner slammed Ford for planning to open two new auto plants in Mexico. Union negotiators are accusing U.S. Steel of giving them proposals that go back to the “1950s and '60s.” Among them are&nbsp;demands to increase healthcare costs for active workers and retirees, changes in rules that require time-and-a-half overtime pay for all hours worked more than eight in a given day, a reduction in the guaranteed minimum workweek from 40 hours to 32 hours, the ability to use nonunion contractors for maintenance work, and a rollback in seniority rights. That tough line comes as another American steel company, Allegheny Technologies Inc., continues to lock out more than 2,200 unionized&nbsp;steelworkers in response to stalled contract talks. Global steel giant&nbsp;ArcelorMittal, which operates some plants in the United States,&nbsp;also is in negotiations&nbsp;with the Steelworkers over a contract that expires Sept. 1. U.S. Steel spokeswoman Courtney Boone declined to comment on the ongoing talks or about the tough market conditions shaping&nbsp;the approach to bargaining. Both sides, however, appear to remain far apart as the Sept. 1 deadline nears. Trying to extract concessions because of hard times is a time-tested company bargaining tactic, says Kate Bronfenbrenner, director of labor education research at Cornell University’s School of Industrial and Labor Relations. While conventional wisdom suggests it’s unwise to strike at a company in the middle of a downturn, Bronfenbrenner says the Steelworkers could well ride out a potential work stoppage, enlisting the support of their labor movement allies in the United Kingdom, Germany and elsewhere to put pressure on the company. “This is a union that doesn’t give in on concessions,” says Bronfenbrenner, pointing to some of the union’s grueling battles in the recent past -- a bitter lockout at Ravenswood Aluminum in West Virginia from 1991 and 1992, and another two-year strike at Bridgestone/Firestone Inc. that ended in 1996. Earlier this year, the Steelworkers went on strike at a dozen refineries, winning a contract for about 30,000 workers that avoided the concessions demanded by oil companies. If it came to that, Charles F. Chapman Sr., a 20-year veteran of the mill, knows what side he’s on.